Over the last several years, “edge computing” has become one of the most talked about trends in IT, and for good reason. Nearly every industry is recognizing the limitations of supporting users and emerging technologies through centralized IT infrastructures and is pushing storage and computing closer to users and devices. That shift is becoming necessary because of the increased connectivity of devices and people and the huge volumes of data they generate and consume. 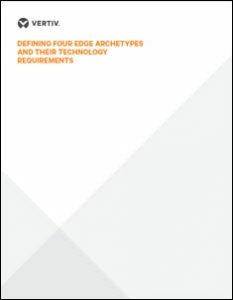 Download the new white paper from Vertiv to learn more about edge computing and the four edge archetypes the company has identified.